As summer tentatively approaches, we tasked Swizzlers to create a refreshing serve based on the ever-glamorous apéritif cocktail – and they certainly delivered. Last month we tested Swizzlers with an apéritif brief that saw entrants create a pre-dinner drink that would be a perfect fit for the menu of any traditional trattoria, using either Bianco or Rosso Martini vermouth – and it was Alan Kennedy’s “light, refreshing, and delicious” cocktail, The Odd Man, that stole the show. Francesco Petracci, head bartender at Bar Americain at Brasserie Zedel; Tschaka Prescod, bar manager of Del’Aziz Bermondsey; Fabio Adler, marketing manager at K Bar, The Kensington Hotel; and Melita Kiely, senior staff writer of The Spirits Business, picked the cocktail as their favourite from 10 of the best entries, which were crafted to spec by K Bar’s bar manager, Ben Manchester. A simple and effective blend of Martini Rosso, Wenneker 24 Carrot, Bonded Bourbon and Jerry Thomas Decanter Bitters, The Odd Man impressed judges from the very first sip. Second place was awarded to Blue Jay Spritz by John Livanos, which judges said “perfectly” followed the guidelines of the brief, and following close in third place was Diego Cruz’s cocktail, Chez Cruise; a combination of Wenneker Elderflower Gin, Martini Rosso, Wenneker Lychee, Angostura Bitters and egg white. Kennedy’s recipe will now go through to the semi-final in October, when all nine winning drinks from throughout the year will be recreated once more and judged against each other. Five drinks will then be chosen to go through to the grand final in November. The bartender behind the winning recipe will be crowned Wenneker Swizzle Master 2016 and scoop £1,000. The next Wenneker Swizzle Masters round is Summer Scotch. Create a delightfully refreshing long drink to sip in the shade, using Balvenie 12 Year Old Doublewood. 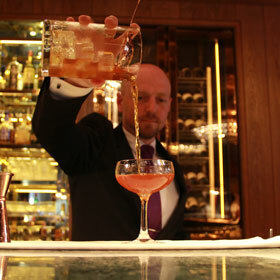 Bartenders have until 12 May to submit their recipes online at www.swizzlemasters.com.